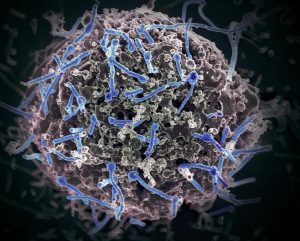 Scientists at The Wistar Institute and collaborators have successfully engineered novel DNA-encoded monoclonal antibodies (DMAbs) targeting Zaire Ebolavirus that were effective in preclinical models. Study results, published online in Cell Reports, showed that DMAbs were expressed over a wide window of time and offered complete and long-term protection against lethal virus challenges. DMAbs may also provide a novel powerful platform for rapid screening of monoclonal antibodies enhancing preclinical development. Ebola virus infection causes a devastating disease, known as Ebola virus disease, for which no licensed vaccine or treatment are available. The 2014-2016 Zaire Ebola virus epidemic in West Africa was the most severe reported to date, with more than 28,600 cases and 11,325 deaths according to the Center for Disease Control. A new outbreak is ongoing in the Democratic Republic of Congo, with a death toll of more than 200 people since August. One of the experimental avenues scientists are pursuing is evaluating the safety and efficacy of monoclonal antibodies isolated from survivors as promising candidates for further development as therapeutics against Ebola virus infection. However, this approach requires high doses and repeated administration of recombinant monoclonal antibodies that are complex and expensive to manufacture, so meeting the global demand while keeping the cost affordable is challenging. “Our studies show deployment of a novel platform that rapidly combines aspects of monoclonal antibody discovery and development technology with the revolutionary properties of synthetic DNA technology,” said lead researcher David B. Weiner, Ph.D., executive vice president and director of Wistar’s Vaccine & Immunotherapy Center, and W.W. Smith Charitable Trust Professor in Cancer Research. The team designed and enhanced optimized DMAbs that, when injected locally, provide the genetic blueprint for the body to make functional and protective Ebola virus-specific antibodies, circumventing multiple steps in the antibody development and manufacturing process. Dozens of DMAbs were tested in mice and the best-performing ones were selected for further studies. These proved to be highly effective for providing complete protection from disease in challenge studies. The Weiner Laboratory is also developing an anti-Ebola virus DNA vaccine. Preclinical results from this efforts were published recently in the Journal of Infectious Diseases.